FINE APPEARANCE. A RARE EXAMPLE OF THE ONE-CENT 1861 FIRST DESIGN. ONLY 22 UNUSED EXAMPLES ARE AVAILABLE TO COLLECTORS. Our census of Scott 55, available at https://siegelauctions.com/census/us/scott/55 , contains a total of 26 examples. Three have target cancels and one is in The New York Public Library's collection. Of the remaining 22 copies, thirteen have faults ranging from serious defects to pulled perfs. Two need to be confirmed, as they have not been seen for a long time. The example offered here, with a minor thin spot, is very desirable. FINE APPEARANCE. A RARE EXAMPLE OF THE 5-CENT 1861 FIRST DESIGN. ONLY 36 EXAMPLES ARE KNOWN. Our census of Scott 57, available at our website at http://siegelauctions.com/census/us/scott/57 , contains a total of 37 copies of this rarity. Of these, one is in The New York Public Library collection. Of the 36 thought to be available to collectors, two are cancelled, 19 have no gum, five have part original gum and ten have full (or nearly full) original gum. Only two of the full or part original gum copies are confirmed as sound, and four others need to be examined as they have not been seen for decades. Census No. 57-OG-27. With 1993 P.F. certificate. This is the first example with original gum we have offered since 2013. EXTREMELY FINE APPEARANCE. 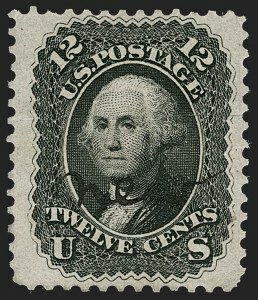 ONE OF ONLY FIFTEEN EXAMPLES OF THE 12-CENT 1861 FIRST DESIGN AVAILABLE TO COLLECTORS. AN OUTSTANDING RARITY. The 12c is the rarest of the 1861 First Designs and Colors, with a total of 16 examples recorded, including one in the New York Public Library collection. Our 12c First Design census, available at http://siegelauctions.com/census/us/scott/59 , contains perhaps five sound copies. This is the only 1861 First Design/Color with the "new" manuscript notation. 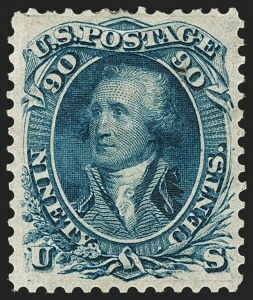 Although it is generally accepted that the 1861 First Designs/Colors were not distributed through post offices (except for the 10c, which was regularly issued), it is apparent that these stamps were not produced as ordinary essays, which typically originate from printers' archives or officials' files. 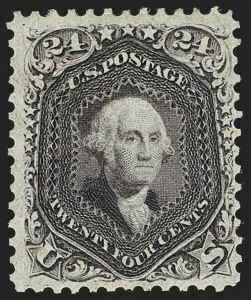 Considering the extreme rarity of multiples (except for the 3c and 10c) and the scattered origins of the 1c, 5c, 12c, 30c and 90c 1861 First Designs/Colors, it is probable that they were distributed through official U.S. Post Office Department channels to other postal authorities to alert them to the new issue when the previous 1851-57 Issues were demonetized (beginning in August 1861). The word "new" on this stamp is evidence of that possibility. FRESH AND FINE. A RARE SOUND ORIGINAL-GUM EXAMPLE OF THE 24-CENT 1861 DARK VIOLET EARLY TRIAL PRINTING. 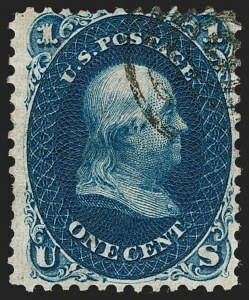 ONE OF THE RAREST OF THE 24-CENT 1861-63 ISSUE SHADES. The Dark Violet trial printing and Violet regular issue shades are often confused, and the Scott Catalogue adds to the confusion by putting the Dark Violet (the old Scott 60) in the Trial Color Proofs section as 70TCe, while the Violet gets a front seat as Scott 70c. In our opinion, there is no good reason to relegate the Dark Violet to the Trial Color Proof section. As a result, the stamp offered here is undercatalogued in relation to other 24c stamps of equal rarity. For example, Scott 70c has a value of $35,000.00 versus Scott 70TCe (60) at $15,000.00. With 1968 P.F. certificate. This is the first sound original-gum copy we have offered since 2015. FINE APPEARING EXAMPLE OF THE RARE 30-CENT 1861 FIRST COLOR. ONLY 33 ARE CONTAINED IN OUR RECORDS, OF WHICH 32 ARE AVAILABLE TO COLLECTORS. Our census of Scott 61, available at https://siegelauctions.com/census/us/scott/61 , contains a total of 33 examples, including one in the Miller collection at The New York Public Library. Virtually all are centered to one side, and many are centered to two sides. 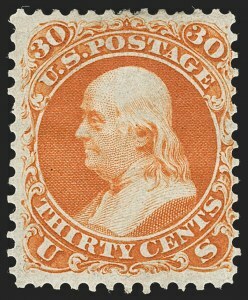 A characteristic common to most examples of the 30c 1861 First Color is creasing, which in some cases is very severe and in others barely visible. 90c Blue, First Design (62). 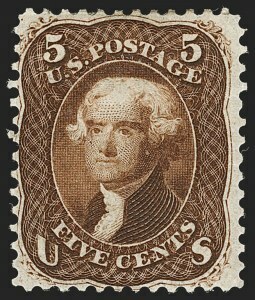 Original gum, traces of h.r., deep rich color, choice centering for this difficult issue, light diagonal creases at top left, small hole in top right "90"
EXTREMELY FINE APPEARANCE. A RARE ORIGINAL-GUM EXAMPLE OF THE 90-CENT 1861 ISSUE FIRST DESIGN. ONLY 21 ARE AVAILABLE TO COLLECTORS, AND ONLY EIGHT ARE KNOWN WITH ORIGINAL GUM. Our census of Scott 62, available at https://siegelauctions.com/census/us/scott/62 , contains 22 examples, including one copy in the New York Public Library collection and another copy certified as a privately-perforated No. 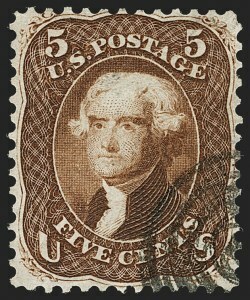 62a, which comes from a set in the Col. Green sale that was signed by John Luff (we believe this stamp to be genuine). Another has been certified as genuine with a trial cancel. 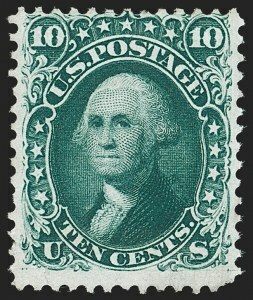 Excluding the NYPL copy and the ex-Green stamp just noted, only eight examples of the 90c First Design are available with original gum. Of these eight, only three are sound. The example offered here has better centering than most. FINE APPEARANCE. A RARE CANCELLED EXAMPLE OF THE ONE-CENT 1861 FIRST DESIGN. ONLY 26 ARE RECORDED IN OUR CENSUS, AND OF THESE ONLY THREE HAVE CANCELS. Our census of Scott 55, available at https://siegelauctions.com/census/us/scott/55 , contains a total of 26 examples (one is in The New York Public Library collection). Three have target cancels, struck in a corner. National Bank Note Company apparently submitted gummed and perforated samples of their designs. Of the original submitted designs, the 24c and 30c were not altered in any way before approval and use. 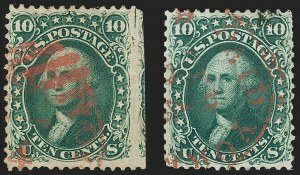 The original samples for these two denominations were printed in a different shade, and are currently listed in the Trial Color Proof section of Scott Catalogue. 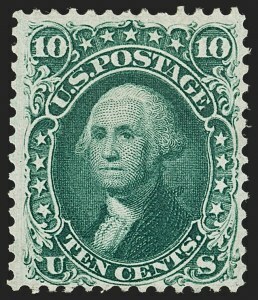 A quantity of the 10c First Design was printed and issued from this original plate, although they were likely printed after the normal stamp (Scott 68) was issued. The likely reason is that the original plate was brought into use to keep up with demand for the 10c stamps. Therefore, only the 10c, 24c and 30c plates as originally made were used to print issued stamps. The other denominations -- 1c, 3c, 5c, 12c and 90c -- Scott Nos. 55, 56, 57, 59 and 62 -- were never issued in their original designs. These are called "Premiere Gravures" or "First Designs" by students of the issue. It is likely that a small supply of the First Designs and Colors reached philatelic hands at an early stage. Several other First Designs are known cancelled, but the placement and style of cancel means that some cannot conclusively be shown to have gone through the mails, and are likely experimental or control cancels. This stamp originally formed a horizontal pair with Census No. 55-CAN-17. The placement of the cancel would indicate it was used to cancel a block of four. The third recorded example with a cancel is also struck in a corner (bottom left), but does not belong to the reconstruction, so our supposition is that at least two blocks were prepared with the target cancel. Both the 5c offered in lot 100 and this 1c were submitted to The Philatelic Foundation by Raymond H. Weill in 1962 and both have small thin spots, so likely originate from the same source. Census No. 55-CAN-18. Ex "Concord". With 1962 P.F. certificate. The most recent P.F. certificate for the adjoining position notes "Genuine but decline opinion with respect to the origin and/or purpose of the cancel", and we would expect the example offered here to receive a similar certificate. VERY FINE APPEARANCE. 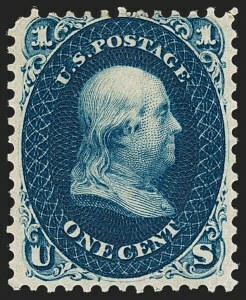 A RARE AND DESIRABLE CANCELLED EXAMPLE OF THE 5-CENT 1861 ISSUE FIRST DESIGN. ONLY 36 ARE AVAILABLE TO COLLECTORS, AND OF THESE ONLY TWO ARE CANCELLED. Our census of Scott 57, available at our website at http://siegelauctions.com/census/us/scott/57 , contains a total of 37 copies of this rarity. Of these, one is in The New York Public Library collection. Of the 36 thought to be available to collectors, 34 are unused. It is likely that a small supply of the original designs and colors reached philatelic hands at an early stage, which accounts for their existence in the hands of collectors. Several other denominations are known cancelled, including the 1c, 12c (with manuscript "New" written across the design) and 30c, but the placement and style of the target cancel means that they cannot conclusively be shown to have gone through the mails, and may be experimental or control cancels. Both the 1c offered in lot 99 and this 5c were submitted to The Philatelic Foundation by Raymond H. Weill in 1962 and both have small thin spots, so likely originate from the same source. One of the two used copies of Scott 57, with a clear postal marking, was offered in our sale of the Natalee Grace Collection. The example offered here is the only other with a cancel. Census No. 57-CAN-30. Ex "Concord". With 1962 P.F. certificate. Other similarly cancelled items have received recent P.F. certificates stating "Genuine but decline opinion with respect to the origin and/or purpose of the cancel", and we would expect the example offered here to receive a similar certificate.